A group of nurses who filmed themselves squishing a newborn’s face fired after viral video enrages public. The group of Saudi nurses who filmed themselves laughing while cruelly squishing the face of a hospitalized newborn have been fired after their video was circulated online. The infant’s family found out about the alarming treatment their child had received at the hands of these nurses after the video was shared on social media. 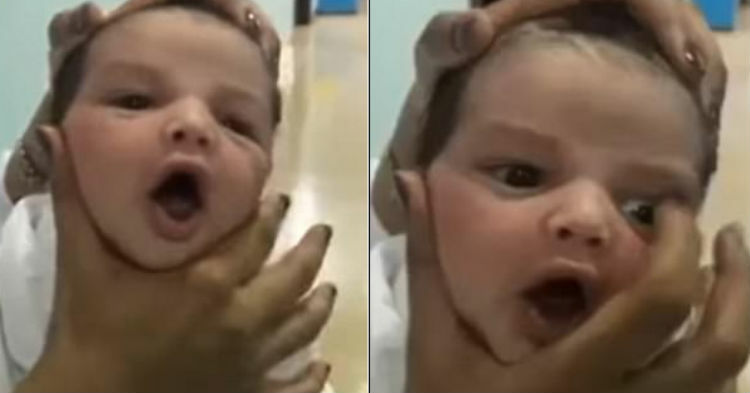 In the unsettling video, a nurse can be seen repeatedly grabbing the infant by the neck and forehead, and inhumanely squishing the baby’s face, while the onlooking nurses laughed. The three nurses, who were working at a maternity ward in the city of Taif, located in the Mecca Province of Saudi Arabia, were quickly identified and located. ‘The Health Affairs investigated the source of the video and was able to identify the nurses who appeared in the video and the hospital where the incident took place,’ said Taif Health Affairs spokesperson Abdulhadi Al-Rabie. The newborn’s father informed Saudi media his baby had been in the hospital for ten days for treatment of a urinary tract infection and was appalled after seeing the video widely circulated on social media platforms. He has called for the nurses, as well as those who disseminated the unsettling video, to be punished. Some have suggested that CCTV should be installed throughout the hospital to aid in preventing the occurrence of a similar event. However, considering this event together with Saudi Arabia’s lack of transparency on human rights abuses, a larger scale overhaul of monitoring systems in place to prevent abuse in the medical system may be a more prudent response. Al-Rabie stated that the nurses, if found guilty of the documented abuses seen in the video, will face severe penalties. While the appearance of this sort of content on social media is shocking, in this instance it allowed authorities to remove unsavory people from a position where they were endangering the lives of defenseless children. Newborns count among the most vulnerable within society, so ensuring they receive appropriate care is an issue of paramount importance. No parents should feel unsafe leaving their children in the hands of medical professionals.